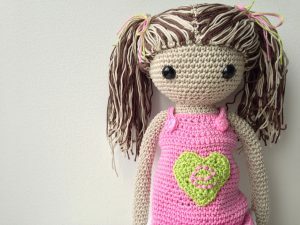 Sarah’s (Annaboo’s House-blog) first book came out (“Beginner’s Guide to Crochet”). 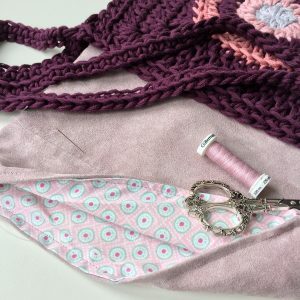 This was kicked off with a fun blog hop, and I loved being part of it (you can read that blog post here). 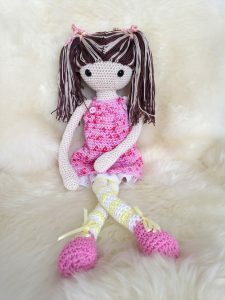 In the meantime her second book (“Extreme Crochet”) was released later that same year, and this month we’re celebrating the launch of what’s already her third book, yay! 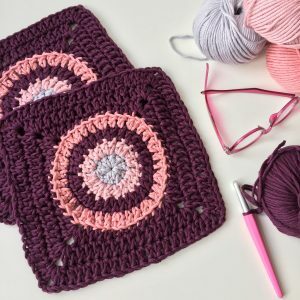 And even more “yay”, because there’s another blog hop taking place due to the latest book’s release, “Supersize Crochet”, and the “yay-est” of it all: I’m part of it again ;). I’ve loved Sarah’s work from the moment I found her IG-account, which must have been right after I joined IG (early 2013). I salute her craftsmanship, and the fact that there are no boundaries to what she designs: blankets, baskets, shawls, flowers, cushions, amigurumi, you just name it – she does it, and she does it very well. When I come to think of it: I like it that Sarah explores all possibilities that we crocheters have. She has no problem designing whatever she puts her mind to – no matter the crochet technique. 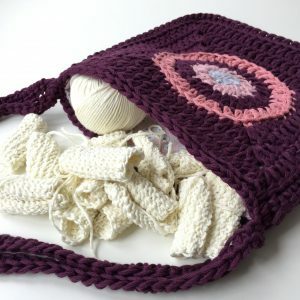 This time around it is all about projects made with a big fat hook and super chunky yarn, how fun is that! She can be very proud of herself, because she has made a great book once more! It has a wonderful variety of projects, and I love the overall crisp look of the book. 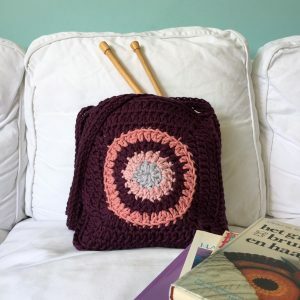 It wasn’t exactly easy to pick just one project, but (like most women): I love bags, and so went for the “Ombre Circles Tote Bag”. I used my beloved DMC Natura XL for my version (chunky, but not super chunky), lined it with a cute fabric I got here, and so like how it turned out! As soon as I can lay my hands on the super chunky yarn needed for the pet bed, that will be the next project I’m going to make from Sarah’s book, it’s so cool! 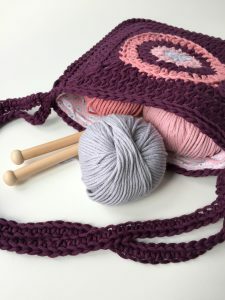 One of the best characteristics of bulky yarn might be the project being finished very quickly, which can be quite nice for a change, don’t you agree? I’ve saved what’s maybe the very best for last……. You see, I’m allowed to give away 1 pdf-copy of Sarah’s book! Just let me know in the comments whether you’d like to enter for a chance to win this super-cool book. I’ll draw a winner Sunday, May 14th, 2017, 8:00 pm my time (GMT+1), and notify him/her soon thereafter. Good luck to all of you! Edit: a winner has been drawn and notified – thank you all for participating! Oh, Marianne! Thank you so much for taking part again and for writing such a wonderful review – ‘m so pleased you like the new book! 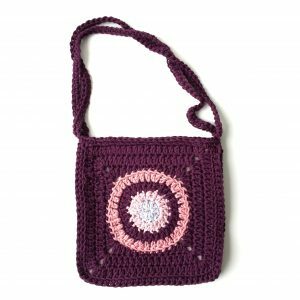 I love the colours you’ve chosen for your bag and the yarn choice works perfectly, too. I would love to win this book! Really eager to my t shirt yarn ???? I love your bag, great colors, and would love to win a PDF copy of the book ???????? Leuke tas. Die wil ik ook wel maken. Dan eerst het boek winnen bij jou, leuk dat je 1 mag weggeven. I would absolutely love to win this !!! Thank you ! I would really love to win. I pray I’m not too late. Doe graag mee want je kan tenslotte niet genoeg haakboeken hebben, laten we eerlijk zijn ???? Kijk ook enorm uit naar jou boek ???? Id love to win! Thick yarn with giant hooks are my favorite projects! I’ve added your name to the list, Brady – thanks for joining in! 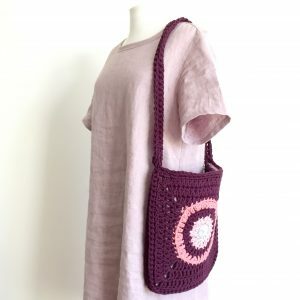 Love your gorgeous granny bag and would love to win a copy of this book!